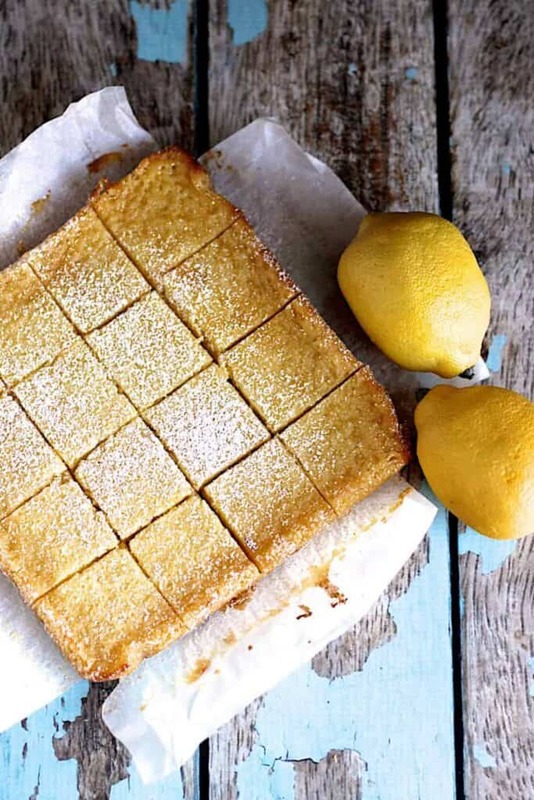 These Whole Lemon Bars are sweet, tart, and delicious. You make them using an entire lemon! 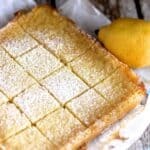 I’ve made these lemon bars several times in the past. 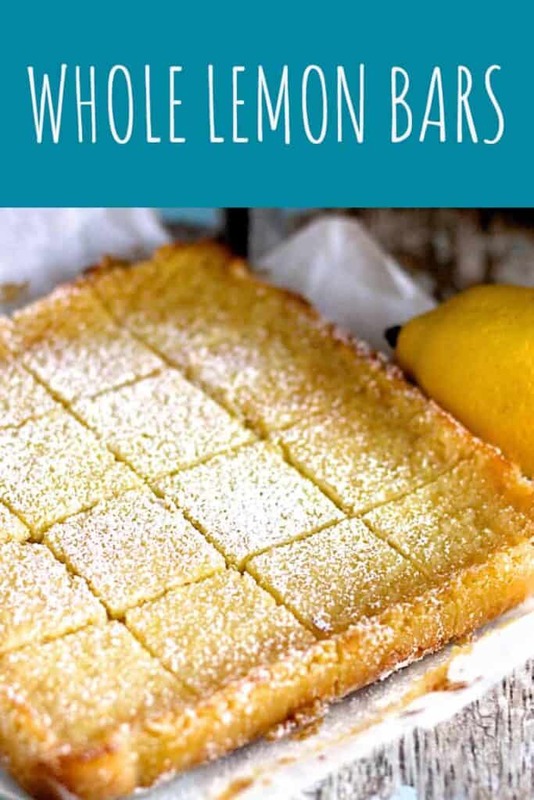 Friends have variously touted these bars as “the best lemon bars I’ve ever had” and “on fleek”. While I, personally, would probably not say “on fleek” in a non-ironic way, it is a pretty serious compliment. 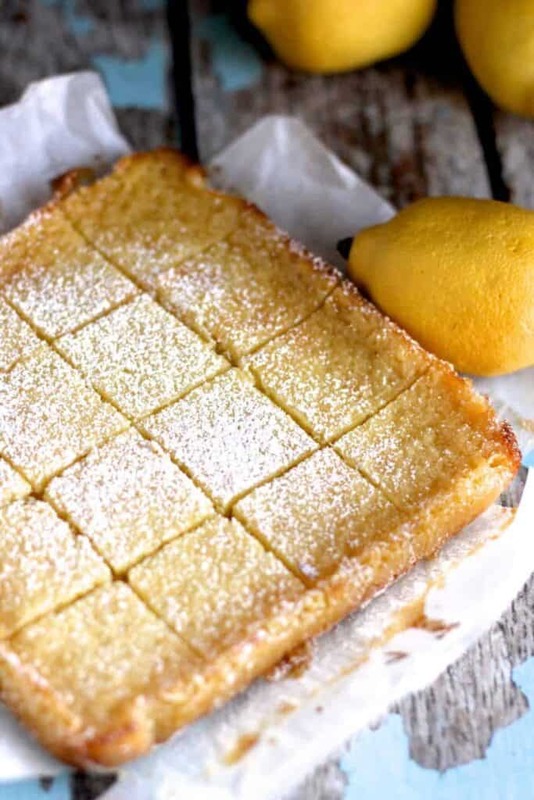 And honestly, these lemon bars are pretty dang fantastic. 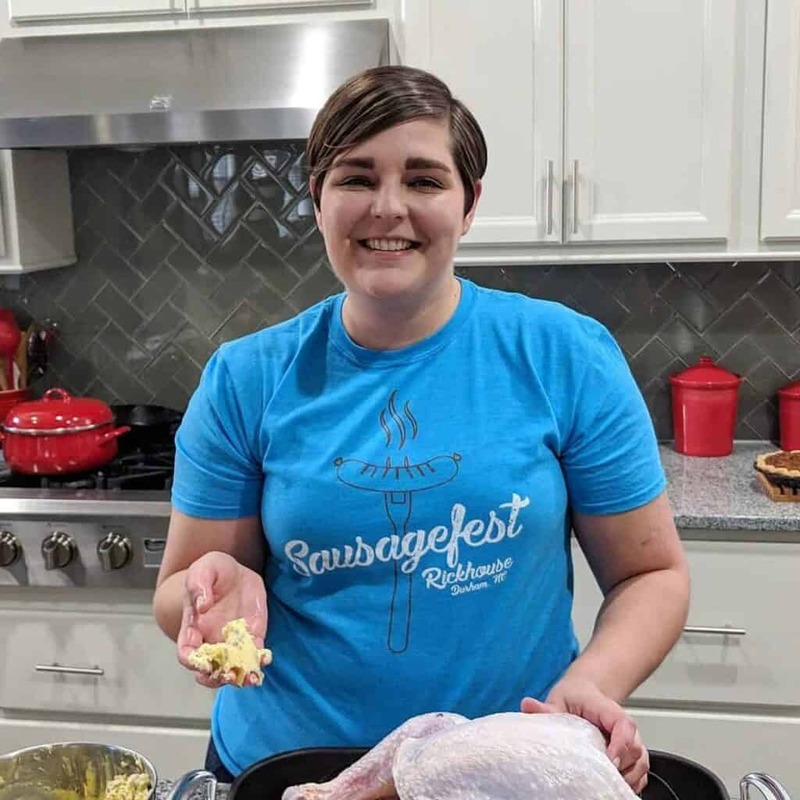 This recipe comes from The Smitten Kitchen Cookbook. Preheat the oven to 350 degrees F. Line an 8x8-inch baking pan with parchment paper, and spray the paper with cooking spray. Set aside. Combine the flour, sugar, and salt in the bowl of a stand mixer. Pulse a couple of times until things are combined. Add the cold butter and pulse until the mixture is powdery. If you pinch the mixture, it should hold it's shape. Press the crust into the bottom of the prepared baking dish, allowing the crust to go about 1/2 an inch up the sides of the pan. Poke it all over with a fork and bake for 20 minutes. Start by cutting the lemon in half. If the white part of the skin is thick (i.e., 1/4 inch or more), peel the skin from half of the lemon before continuing. The second half can be used as it is. If the white pith isn’t too thick, just proceed to the next step without peeling anything. Cut the lemon halves into thin slices, removing and disposing of any seeds. Put the lemon slices in the bowl of the food processor. Add the sugar and run the food processor until the lemon is thoroughly puréed (about 2 minutes). Add the butter and run it again until the mixture is smooth. Scrape the sides of the work bowl as needed. Add the eggs, cornstarch, and salt to the food processor. Pulse until well-combined. Pour the lemon filling over the crust and bake for 35-40 minutes. The bars are done when the filling jiggles only a little bit in the middle. Let the pan cool completely on a rack. Once cooled, cut the bars into 16 squares. Dust with powdered sugar. Store the bars in the fridge if not eating immediately. Interesting. How does including the rind make this dessert better? I assume it would just give the filling a slightly firmer texture and make it taste more bitter. In my experience, it makes it seriously lemony, and gives it a bit of bitterness. Which is actually nice given how much sugar goes into lemon bars. These look great! And if it’s a recipe from Deb, certainly has to be good. 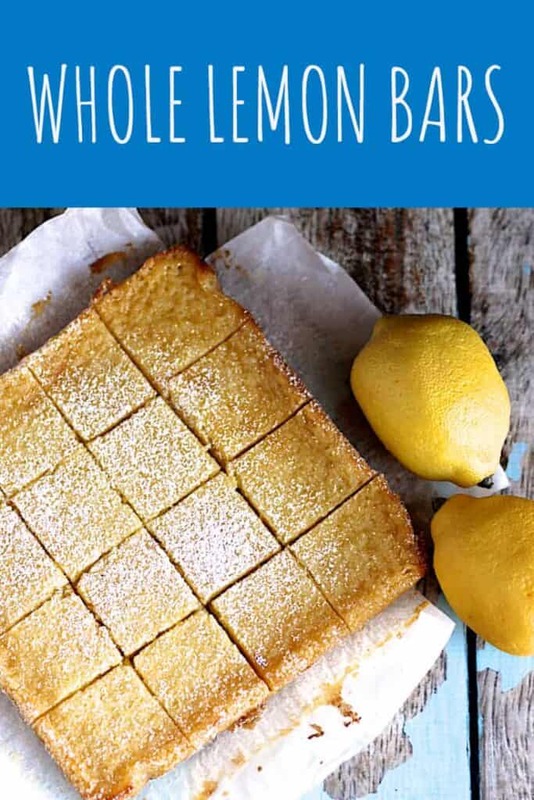 I do love the idea of adding the whole lemon, basically – any bitterness will probably be covered by the sweet sugar anyway I’d imagine! Thank you!! And I totally agree: If it’s from Deb, you know it’s gotta be good =). Yummy! I love love lemon bars and my lemon tree is exploding with lemons right now. Going to try these bars this week.